This book is just so much fun! Pirates, mad scientists, forbidden love, and a deadly chase…what more could I ask for in a historical adventure? From the blurb, I could tell The Gentleman’s Guide to Vice and Virtue would be unlike anything I’d read before. I had the sense that it would be hugely entertaining, but what I didn’t expect was that it would be as poignant as it is funny, or that it would make me cry as much from heartache as with laughter. Monty is a fantastic hero, incredibly flawed as the best characters tend to be. He’s reckless to the point of selfishness—at least in the beginning—intent on nothing but the quest for pleasure, which often involves falling into bed with whomever takes his fancy, male or female. I have to admit, there were numerous occasions where I wanted to sit him down and give him a good talking to, and naturally, it’s only a matter of time before his outrageous behaviour leads him into trouble. Yet, also like the best characters, there’s more to Monty than initially meets the eye. As the story develops, more is revealed about his past and the father who despises him, so that I gradually came to understand why Monty is the way he is. The blossoming romance between him and his closest friend is particularly powerful. Monty’s love for Percy is his saving grace, the one thing that keeps him from veering completely off the rails, and by the end of the novel he’s a far better person than at the start. Characters being discovered to have hidden depths is a recurring theme in this book. First there’s Percy, Monty’s rock and steadying influence, the friend who’s always there, calm, unshakable, but who conceals a secret that will tilt Monty’s world on its axis. Then there’s Monty’s younger sister, Felicity. She plays the role of dutiful daughter, seemingly with no room in her head for anything but romance novels, while harbouring a sharp intelligence and an ambitious outlook for her future well beyond her time. Though this is essentially a light-hearted romp across Europe, packed with high jinks and hilarious moments, the novel does have a darker side. From abuse and racism, to class prejudice and the stigma associated with epilepsy, Mackenzi Lee tackles some weighty issues. I doubt any historian would hold this book up as an example of historical accuracy, but really…who cares? Everything from the gorgeous backdrops to the attitudes of the period felt authentic, and for me, this is all that matters. 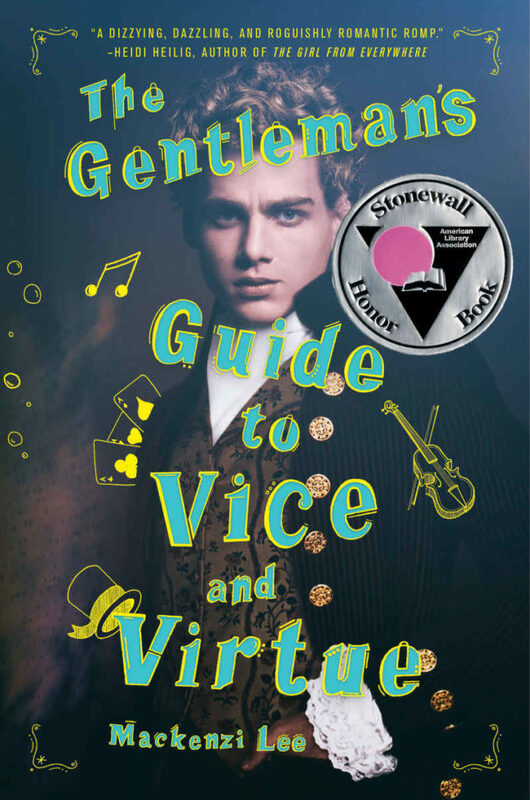 For the brilliant character development, some vividly-described settings, and a suspenseful plot full of twists and turns, The Gentleman’s Guide to Vice and Virtue by Mackenzi Lee gets 10/10 rainbows.